16th of April 1917. The 77. 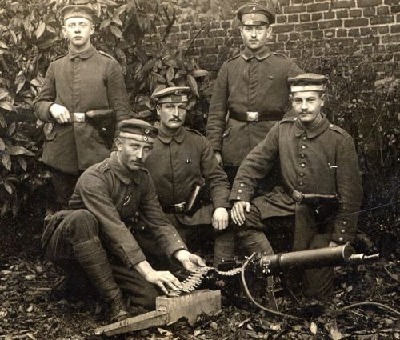 Infanterie Regiment of the 20. I.D. moves up to relieve the hard hit 16. R.D. and retake positions lost to the French in the Nivelle offensive. We leave the 12. Komp. as battalion reserve in the dugouts to the rear. We are to advance using every forest or piece of high ground to take cover. Jogging through Cheret as the road Bruyeres-Monthenault is under balloon observation. Up and down the tree covered hills the battalion clambers. The sun is burning down, the first spring sunshine; we do not have a single drop of water, we long to reach the front line. For two days not a wink of sleep, it cannot be helped, we must go forward. Past "les Carrieres" farm, along the Presles heights, about 7km to the south of Laon, always through forests, undergrowth and brambles. Luckily one of my men had snuck into the abandoned town Bievres at night and ignoring the exploding shells had "liberated" some bags of biscuits, we now at least had something to nibble. In June 1916 the 20. I.D. was on the eastern front helping stop the Brussilow offensive. 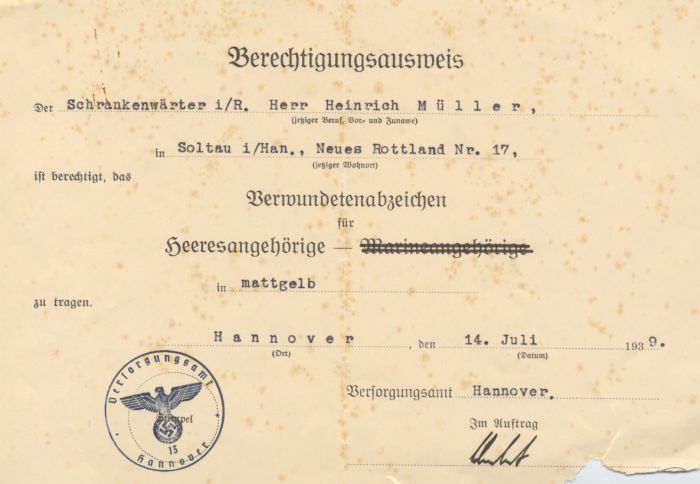 Gefreiter Heinrich Müller was wounded in the fighting and was back home at the Regiments Ersatz battalion when the preliminary award document for his Iron Cross 2nd class caught up with him. We turn towards the southeast, pass the farm of Chaumont on the Höhe 207 and arrive at 7:00 pm taking up position in the tree line along the road to Colligis. The 4th section of every company stays in Colliges as a working party and supply carriers. After a short rest we march into the town, it is pouring with rain again. The ruins with their broken windows have a depressing effect, the whole town makes one feel somewhat uneasy. We leave the town and march in groups across the meadows and swamp between Pancy and Grandelain, 50 meters separating the groups. There is shell hole after shell hole, the earth looks as if it has been ploughed over by Titan. On the other side the companies reform as they reach the steep slope leading up to Courtecon. Here we are safe from enemy fire. In the meantime night has fallen, troops of wounded are crossing our paths. "How is it up there" we ask. "Bad..." comes the reply, "… but they are not getting through. Give them one for us comrades!" Wagons, heavily laden with munitions rattle past, get stuck in shell holes. Six to eight men struggle at each wheel, the horses feel the whip...two, three times they strain in their harnesses then the wagon is moving forward again at a gallop. 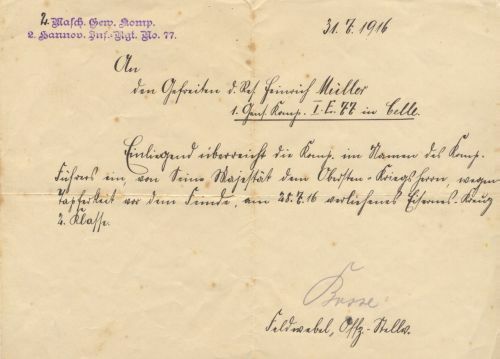 In November of 1916, while back at his regiment, Gefreiter Müller received a more formal award document. We pass to the right of Courtecon which is under heavy fire then our last energy is collected to climb the heights. Countless flares, green and white allow us to see the way. A wonderful show of lights in the heavens, but we have no time for that, at least it lights us the way. We stumble over tree trunks, barbed wire and wooden steps. At last we reach the top. The march is over, the battalion made it without loosing a man in spite of the balloon observation and Sperrfeur (Artillery barrage). It is hard to believe! The game can start. We are to be used right away but our positions are filled with assault troops. We divide ourselves into groups and occupy some wooden huts and a few Stollen (underground bunkers). We huddle here, close to each other, wet through, covered in mud, sitting on our backpacks and smoking. Around us the artillery is going wild, shells and mines of the heaviest calibre are making the ground shake, mixed in with the noise are the cracks of hand grenades and the rattle of machine guns. At 4.00 am the order comes to get ready for the assault. Carefully we prepare getting our packs ready, checking our grenades, iron rations, helmet on... then it is out into the positions. Snow, hail, rain and an icy wind from the east. It fits perfectly to the chaos around us, to the terrible thunderous battle. A few hundred meters along the slope and then into the trench. The assault can begin. The dawn is pale as we work our way from shell hole to shell hole, knee deep in mud, finally reaching the Rheinland Graben (Trench) which we, the 10. Komp. have to take. Here we suffer our first losses, many of them good friends that we have gone through much suffering with. Suddenly I am hit as well, a splinter in the left thigh. The same left thigh that had been hit in the assault in Poland... I jump into a foxhole, remove my trousers and apply my bandage. "Goodbye Comrades and good luck! See you back home!" but it took five hours before I could make my way back through the fire. That night I was in a Feldlazarett, my thoughts with my comrades at the front and my loved ones back home... I fell into a deep exhausted sleep from which not even a barrage could wake me! 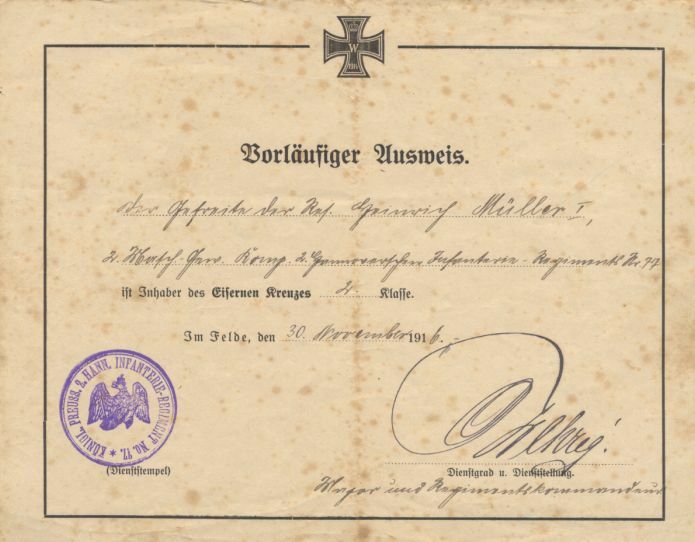 The award document for Heinrich Müller’s wound badge in Gold, an exceptionally rare award.